Jan 2019, San Francisco: Mozilla Thunderbird is a leading open source, cross-communication platform, and calendaring email client that is free for business as well as personal use. It is installed on Ubuntu desktop systems by default. Mozilla Team is working to make some real improvements to its Thunderbird desktop-based email client that incorporates a facelift to User Interface (UI) and better help for Gmail. According to Mozilla, looking into the future, this year seems splendid for the Thunderbird project. As per the official website of Mozilla, the company is starting the new year with hiring some new staff to the Thunderbird group. This will put at upwards of 14 full-time associates on the staff. Doing this will open a world of possibilities for what the team is able to accomplish for Thunderbird redesign. The project strategy was designed after that of the Firefox web browser. Ryan Sipes, Thunderbird Community Manager declared that a huge number of Thunderbird UI update has been planned for the year 2019 and will be made possible by Thunderbird’s developing staff that currently includes eight people with upwards of six more in transit. They will we focused on UI sluggishness and performance issues, improving notifications, enhancing Gmail support and ensuring its features translate into Thunderbird as well as making it simpler for end users to encrypt emails. The team is also going to hire engineers whose main focus will be security and privacy. 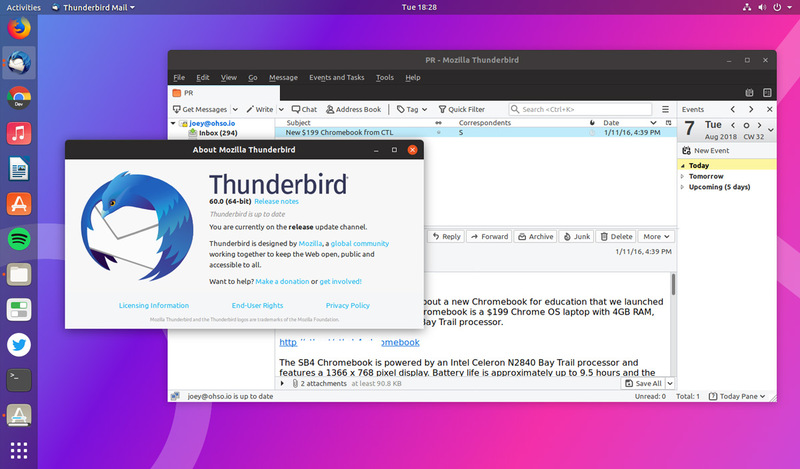 Mozilla with upcoming Thunderbird 2019 is going to improve notifications in the application for better integration with a built-in notification system of each OS. Existing hires are addressing technical debt and performing fair when it comes to Thunderbird codebase. The new hires will likewise be tending UI-slowness and basic performance issues of the application. This area will be one of the best improvements in upcoming Thunderbird 2019. Apart from this, the team is looking into new and faster technologies in rewriting the parts of Mozilla Thunderbird and working in the direction of a multi-process Thunderbird. Thunderbird team is going to work on UX and Thunderbird UI update improvements as per considerable feedback in 2019. Along with the addition of new team, it will focus on enhancing the work experience for its users across the board. One area of usability is the team is addressing integrated improvements in multiple areas. Gmail support is one of its main focuses as the team is going to address Gmail label support and guarantees Gmail experience translate into Thunderbird. Mozilla is planning to improve notifications in Thunderbird via better integration with every Operating System’s inbuilt notification system. After working on this feature, Mozilla will feel more native on every desktop as well as manage notifications from the app. The UX/ UI encryption and settings will become a service in the year 2019. Also, the team hope to make Email encrypted and ensures private communication simpler in upcoming releases. Multi-process Mozilla Thunderbird with Frame scripts etc. Eventually, Mozilla has many bettering plans for Thunderbird that still needs to be worked out and a few changes mentioned here might not be ready at the time of next Thunderbird release. However, once they arrive, it will accept the improvements for Thunderbird.